Microsoft's CEO Satya Nadella believes that "work is no longer a place you go to," as the combination of data and machine learning have a profound impact on us as human beings. Nadella, speaking at Microsoft's Future Decoded event in London, not only showed off his iPhone homescreen, but also talked about the way in which our worlds are transforming. 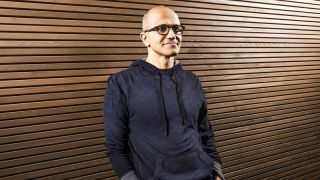 "Data and machine learning and intelligence are being used to transform...applications we use on a daily basis and that have a profound impact on us as human beings," said Nadella. "Work is no longer is a place you go to. Work is about making things happen where you are and having the experience you need to get things done available on every device wherever," he added. "You need to be able to bring people together in networks that are no longer confined to organisational hierarchy." We're not going to suggest that you take Nadella at his word and don't turn up to work, but it is abundantly clear that those of you who like a proper work life balance have increasingly fewer places to hide.